Child actors are a curious thing. They are popular in their childhood years, beloved by fans and producers, then they grow up and no one wants to work with them. Some of them if lucky, quietly disappear from public consciousness and live a simple successful life, enjoying the success of their child acting days. Those who aren’t so lucky, unable to face the reality that they are no longer the pride and joy of the screen as they once were, result to drugs and other forms of abusive addictions. There are extraordinary cases of those who still maintain relevance in Hollywood despite having fallen into the throes of puberty and lost some of the traits that made them the darlings of the audience in their childhood days. Hayden Byerly is one of such cases. Who is Hayden Byerly? Read below to learn more about the actor. Hayden life as a public personality began at the age of 10. He got his debut after winning a national talent competition in Orlando, Florida. Before he became one of the most popular teenagers in the world, Byerly was just one of the two boys born to his parents, whose identities are currently hidden away from the media. He was born on the 11th of October 2000 in Colorado, did a bit of growing up in Littleton, Colorado before the family relocated to Los Angeles, California. His interest in becoming an actor came off the joy he got from imitating his favorite film and TV characters while watching them. After he won the talent competition, he secured his television role as a guest star in one of Disney’s XD series, the comedy show, Zeke and Luther. A combination of his performance in the Disney show, his talent competition, and his audition helped him secure his first feature film in the same year (2011). He starred in the horror film, 11/11/11. His fame came off his role on Parenthood, a comedy-drama series on the NBC network. He played Micah Watson, a boy with a medical condition that became the best friend of Max Braverman. He began appearing on the show in a recurring role in 2012 until 2014, appearing in 5 episodes. 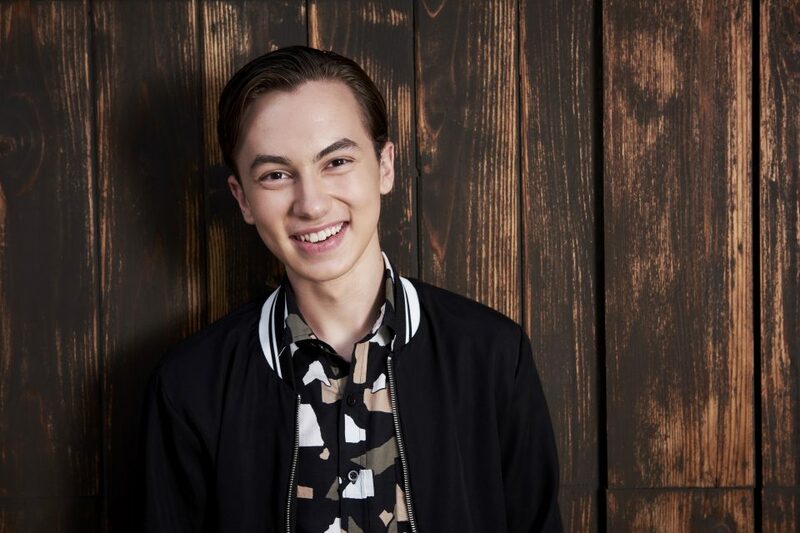 In 2012, Hayden Byerly further expanded his body of work into voice acting roles for video games and an animated series. He voiced video games like Call of Duty: Black Ops II and Final Fantasy XIII and the animated series Sofia the First which was a Disney Channel series where he voiced the character, Prince Gustav. After ending his first two years since he broke into acting expanding his resume with diverse projects, he climbed further ahead in 2013 with The Fosters. He was named as the main cast member of the ABC Family Drama series as the character, Jude Adams-Foster. His character on the show is an abused 12-year-old who was adopted into a large family. The character was written to explore its own sexuality and its excellent portrayal by Hayden Byerly received critical acclaim, notably by Hollywood.com who named the character as one of the “Favorite LGBTQ Characters on TV” both for its convincing nature and the character’s human qualities. His portrayal of the character even sparked rumors that Hayden himself was gay. As a young actor, Byerly education is carried out on set as part of the rules for child actors and actresses. His other interests include reading action adventure and mystery books, playing basketball and video games. He’s also a fan of math. Despite his young age, Hyden has not shied away from lending his voice to social issues of interest to him, such as school bullying. He is an outspoken supporter of the “Be Good to Each Other” campaign. It is a mark of a great acting performance when rumors spread of your sexuality based on your portrayal of a character. Ever since Hayden portrayed James Adams-Foster in The Fosters, he has been subject to rumors of being gay. However, that is not true. As far as we know, Hayden Byerly is a straight man in a heterosexual relationship. Hayden is currently in a relationship with Alyssa Jirrels. The duo has been in a relationship since 2015 and is often seen together in public events, suggesting that everything is fine with the couple. Read Also: Dylan Minnette Bio, Girlfriend – Kerris Dorsey, Net Worth, Is He Gay? As for his family, Hayden has managed to keep their identity away from public eye. He, however, has one younger brother with whom he shared the hobby of imitating film characters before he went on to become an actor. He lives with his family in California. Although he’s still growing, Hayden already has a good height of 5 feet and 8 inches and weighs 67 kg. At the age of 18, he already possesses good looks and features that could make him a staple of the industry in years to come.